Many people have tried to map the Internet – a daunting task, to say the least. 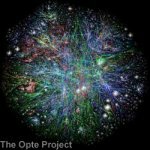 In theory, a little more than 4 billion computers can be connected to the Internet (a limit we are fast approaching for a variety of reasons, by the way), so as you can imagine, this isn’t exactly the simplest activity to do. In the past, nobody’s had a very good idea of how many computers are actually online, because there’s no central authority computers need to report to. Enter the Opte Project. The site has completed one of the rare (if only) maps of every class C network on the Internet (in other words, a good chunk of it). Most impressively, the entire map is built via a variety of open-source packages – including at least three packages in LAMP – Apache, MySQL, and PHP. Perhaps the most impressive statistic of all is the time it takes, from start to finish, to render a map – 268 hours, or 11 days. This could be even faster if they decide to do mapping via a cluster or grid. I briefly spoke to Barrett Lyon, the leader of the project, via IRC. Waileia: What are the points [on the map]? W: So, the edges could represent things like NAT boxes, internal LANs, and so forth? BL: Yes, and the connected dots [and] lines are all routers. While it’s been taken offline due, in part, to the slashdotting, there’s also a page where you can find yourself on the map. Original link via Slashdot. Image used with permission of the Opte Project. My jaunt to CompUSA today took quite some time to complete, as I predicted earlier. Thankfully, the repair tech I spoke with (name withheld to protect the innocent) was incredibly patient and eager to please. He was a trainee, so he had to run back and forth to answer my questions; however, he kept running until every one of my concerns was addressed. I feel indebted to him for his assistance, and I will be sure to let his manager know. My contingency plan is currently either (a) purchase a Tungsten C (with a $100 rebate through January) if I decide to repair the notebook; or (b) bring home a Mac if I don’t. IN OTHER NEWS This is my 100th blog entry. Mahalo nui loa to both casual and faithful readers. I never dreamed this would reach the audience it has, and I’m very appreciative. Thank you all. From Amazon to PCWorld, they [tabs] behave as the files in our file cabinet would. They classify and contain different stuff…However, on Google, they act as lenses…Once you have done a search, you can see the information differently by applying a tab/lens to it. Other changes to the page include gradient backgrounds; more cartoonish icons for Google News, the calculator, and so forth; and a more explicit dictionary.com link. Don’t worry, the famous Goooooooooogle O’s are still there. UPDATE 11/24 10:28 – I just did another search and got the old page. Maybe it’s being phased in? As I’ve mentioned, my computer isn’t in the best shape. With my latest episode of hard drive clunking, I thought I’d give Knoppix a try. I found myself distracted, to say the least. For those of you who don’t know, Knoppix is basically a version of Linux that runs completely off a CD-ROM. Once you boot your computer from the disc, it automatically loads partially in RAM. Due to smart compression algorithms, 2 gigabytes’ worth of programs are packed onto a 700 MB CD. Knoppix is good for a number of reasons – you can do system troubleshooting, demo Linux for others, or just change the scenery from time to time. For me, my motivation was to give my poor hard drive a break while I did some work. Unfortunately, I didn’t get my work done – Knoppix just sent me into “shock and awe.” It was a little challenging to get it burned, but once I rebooted, it just worked. This is on a notebook computer, with a cordless (non-Bluetooth) keyboard and mouse, behind a NAT. As any geek will tell you, this is not an ideal configuration to install Linux on. Yet, most everything works, without any effort on my part. The mouse, even at its lowest sensitivity, moves a tad too fast. My side mouse button, which double-clicks in Windows, behaves inconsistently. The keyboard shortcuts are somewhat unfamiliar. My notebook’s built-in volume controls don’t work – they require a Windows driver. Some files on my hard drive are inaccessible. I don’t know whether this is due to my dying drive, the fact that it’s formatted with NTFS, or because of some permission problem. These problems are minor. Consider, for example, that I’m blogging this on Knoppix, inside Mozilla. At the same time, I have an (empty) document open in OpenOffice, and am listening to a Live365 feed in XMMS, a Winamp clone.